Ready for the summer to be over already? I for one am pretty pumped for this time of year. We just got done with a few great months of video game releases and are starting to make our way through the dog days of summer. One game that usually comes as a breath of fresh air is the latest installment in the NCAA Football franchise. Last years outing was incredible and the question is can this game replicate the big outing last year? Read our full review to find out. First and foremost the big changes last year were completely on the gameplay side of the equation. In NCAA Football 12 the majority of the changes are actually on the modes. That is not to say the gameplay hasn’t been improved. One of the big changes this year is the tackling system, which has been greatly improved. You may have heard EA hyping this up but really what this means in actuality is that the game doesn’t have fully canned tackles. Momentum, timing, and direction play a huge factor in how well a tackle is performed. There have been some other refinements to route running and defensive pressure both on and off the ball. The one thing that still really shocks me is how bad some of the instant replays end up looking. They still have yet to get the whole throwing animation to a point that doesn’t look off. To me one of the big improvements to the game is the Road to Glory that has finally gotten the overhaul it needed. Gone is Erin Andrews and in as a full much improved and less flashy Road to Glory mode. You start off by playing a full high school season that will deem your fate. The real neat part is that you can create a player that plays both sides of the field and its not until the end of the high school season that you have to select which side of the ball you want to play in college. The Road to Glory mode also packs in a great RPG punch that to me really points this mode in the right direction. In order to move up the ranks you need to build up XP both in the field and in practice. It’s a pretty solid but if you’re even half way decent at the game your going to max out your player by the end of their sophomore year. The dynasty mode has been improved with some new features like the ability to take the reigns of being offensive coordinator, defensive coordinator, or even head coach and build up your career to achieve your goals. There is not a ton of new stuff but there is enough in there to keep fans of the series occupied for quite some time. 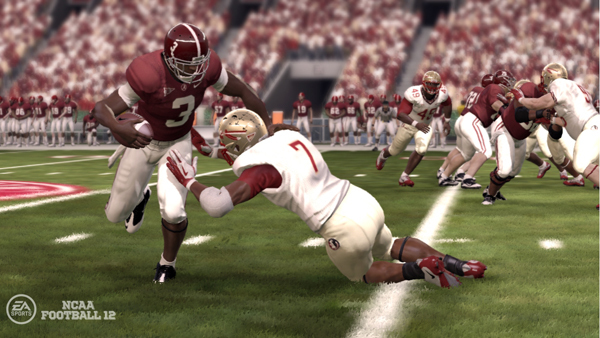 Visually NCAA Football 12 is not all that different from the last few years. The big emphasis this year is on the pre-game festivities that show off many of the college’s traditions that make college sports so exciting. However once the game begins there is not a whole lot of new in the visual department. I mentioned earlier that tackles are much better and visually this couldn’t be closer to the truth. One of my road to glory players was a running back and you could see a huge difference to the way defenses are able to tackle you whether it was with one, two, or even three player takedowns. Last year I was really impressed with how far the franchise had come, it was really the greatest improvement from year to year that we had seen in a while. In this years game however the improvements are incremental and not nearly as impressive as last years. I for one really enjoyed however the new Road to Glory mode which was in desperate need of some updates. You can see the potential in this mode to continue to expand and become even more RPG heavy, which to me is exactly what that mode needs. There is no doubt that NCAA Football 12 is a great game of college football. What it isn’t however is a huge upgrade from last years game. If your looking for a new feel to the Road to Glory mode then this is definitely one you want to check out. Otherwise there isn’t enough new here to make this a must purchase. NCAA Football 11 is a great game of football, it has some shortcomings, but those are overshadowed by an all around excellent football game that I found to be one of the best the series has put out on this generation of consoles. NCAA Football 14 feels like a great culmination of all the NCAA Football titles this generation. The new engine fixes a lot of the weird problems that occurred in the past few games and allows the running game to take center stage. I for one really enjoyed my time with NCAA Football 14 and find it to be a great swan song for this franchise on this generation of consoles. It makes me even more excited for what's to come from this franchise next year with new hardware behind it. If you bought last year’s game there isn’t a huge incentive to go out and pick this one up for full retail price, but if you’re looking to get a fix of college football, NCAA Football 13 is an amazing game of football. With all the things said and done, there is however still a lot of room for the franchise to grow. It has done a great job of moving in the right direction in this game, but you still feel it could have been much more in the future. However if you’re a fan of the series and need your college football fix for the year, this game is a great option for you. For the first time in years I am happy to report that the upgrades in NCAA Football 10 game were enough to make for one of the best NCAA Football titles in years.